But is that true? To test the claim I compared my Social Security statement with my TIAA-CREF statement for a 401(a) plan which is essentially the same as a 401(k). Both list the total contributions made by the employers and myself. The Social Security statement indicates my benefit at 66, the age of my full retirement. My TIAA-CREF statement has the total accumulation. Since I am nearly 66 I can know much an annuity income it is worth. My first year Social Security benefit was 12.61 percent of my total contributions. The first year TIAA annuity was 12.06 of total contributions�lower not higher than the return on my Social Security contributions as the Cato Institute so confidently claims. It is important to point out so that as a professional employee, I am in a relatively high income category with a Social Security rate of return that is less than that of lower-income participants. For them, the rate of return for Social Security compared to private accounts would be much higher than mine, making it an even better deal. Like the optimistic projections of the financial services industry whose interests it serves, the Cato Institute�s claim is based on before-the-fact overly optimistic assumptions of future market returns. My comparison was based on after-the-fact actual experience. from 1967 to 2011. The contributions of my employers and my own added up to $115,000. income of just over $1800/month. being generous with the rate; I think they are now around 4%. This entry was posted on Wednesday, January 12th, 2011 at 10:30 am and is filed under 401(k) type Plans, Featured Posts, Social Security. You can follow any responses to this entry through the RSS 2.0 feed. You can leave a response, or trackback from your own site. 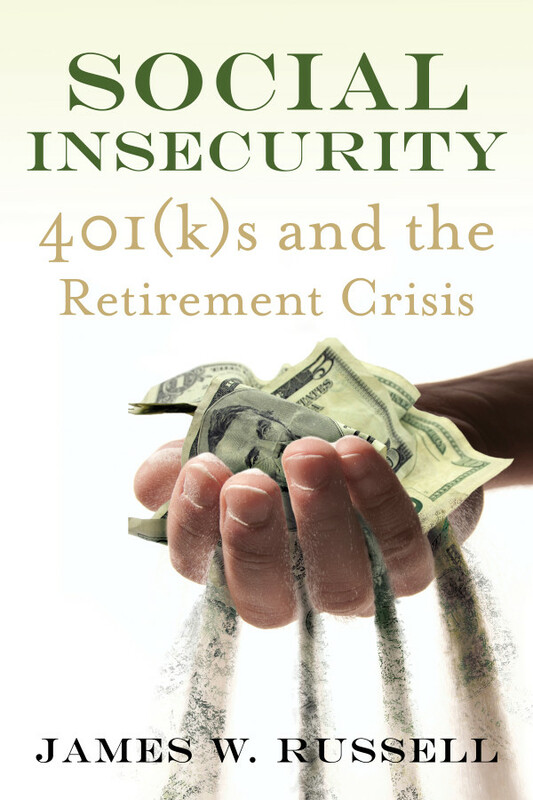 In reading Dr. Russell’s essays on this blog, one begins to see the larger issue raised by the current “pension crisis” crowd — the role of government (and whom it serves). Yet Russell goes beyond the basic frame set by this crowd (not falling the “Is government good or bad?” trap) on to the basic fact that government does have a role to play in such matters, as the pension problem we face, as well as a proper purpose in society. But more to the point, he relies upon the facts in the overall case, not on some rosy, pie-in-the-sky assumption made beforehand. And the facts show that privatized pension plans underperform, overall, when compared to public pensions — and they are surely not secure (such as social security). In addition, Dr. Russell points out that the social security tax reduction put forward by President Obama can be seen as the first such rollback in that program since its inception. Moreover, it is portentous of future directions and social changes. For instance, there have been proposals of late that recommend reducing benefits for higher income workers. Such changes, along with the tax decrease, would not only be unprecedented, but would weaken the base of the program and lessen its broad support — which may be a motive for some. In short, this blog could easily be re-titled, “Just the Facts, Please,” as the facts presented here dispel the fears engendered and set aside the opinions and assumptions of others who decry such plans and programs, even as they (the facts) go to the motives and the context within which all is all cast and will surely play out. And it comes back to the proper place and purpose of the public domain — and at whose expense or benefit. After all, privatization not only feeds into Wall Street, but its attendant outsourcing and dislocation take from Main Street. And while some may profit well from this, many are left holding the bag and taking the loss — and trying to adjust to a new way of life. Thank you for your nice words. Sorry about the site being down most of today during the installation of an upgrade. Total retirement savings at age 45 would equal $1.15 million. Projected benefit at $2700 (unadjusted)- implied annuity (3%) value at age 67 – $430,000 (not considering additional contributions). Conclusion – if I was allowed to opt out of the system and returned all amounts paid, I would be better off. Even if I was required to pay full amt of tax with no benefit for remainder of my career. Or, allow me to keep all contributions here forward and opt out of the system. Make it a social program for those that fail to plan for their own retirement is fine with me, but I own my future, not the government. had a higher rate of return than my 401(k)-like plan. Part of the problem is that we are using different methods. I would caution that projected benefits are only as good as their assumptions. Financial planners were often bullish on 401(k)s because they used overly optimistic assumptions about market behavior. It is important to keep in mind that Social Security also includes disability insurance and spousal benefits for the same payroll contributions. So sure, if you assume an unreasonably low rate of return on a 401k, social security will (kind of) out earn it. And so much other information is left out of this example which is rather anecdotal in nature. How long has the 401(a) been funded? How does TIAA-CREF’s performance stack up against, say, Fidelity’s (5% seems really really low)? What would be the impact of the reduced employer burden? What if your employer only matched your forced contribution into the Social Security system? But you can still achieve a comparable rate of return AND reduce the burden on employers. The only difference is with a 401k, the investment isn’t handled by government bureaucrats at the point of a gun or squandered on feels when the urge arises. Many younger people are proceeding as if they won’t see a dime of their social security, regardless of what the projections say. The money was in TIAA-CREF for 35 years. I don’t think I would have gotten a much different rate if it had been handled by another company. I’m sure that others may have gotten a higher rate of return than with Social Security. However, the comparison with Social Security does not take into consideration all of the additional benefits you get from it: cost of living adjustment, disability insurance, survivor insurance, even insurance for adult disabled children. When the whole Social Security package of benefits is considered, no private plan comes anywhere close to it. I’d like to see your math on this one. I started working in 1982 and according to Soc. Sec., my and my employer contributions equal about $200K. However over this same time period had I earned a 4% average annual return, I would have about $278K. Assuming I work for minimum wage from 2017 until I retire at age 67 and I withdrawal the same $2664/mo as per my Soc Sec report. I would run out of money at age 93 assuming a 2% annual return starting at age 67 or at age 111 assuming 4% annual return. Arguable if I maintain my current income through age 67 the annual interest/return alone would be greater than the benefit received. Not seeing how the Social Security Administration would have been a better steward of my money. Thank you for your comment. When I made the comparison of the rate of return between my 401(k)-type plan and Social Security, the market was down and the rates were fairly close. I don’t doubt that someone could get a higher rate of return. But what that person would not get are all of the other Social Security benefits that are included included in the payment of the with holding tax including: disability insurance, survivors insurance for spouse and children, and (very important) an annuity at retirement that is much more favorable than anything available on the commercial market for 401(k)-type plans. If you put a price tag on all of those benefits that participants get along their retirement income, there is no question in my mind that the total Social Security rate of return far exceeds that of individual investment plans regardless of whether the market is up or down. I know this is an old article but I can’t figure out how your math is correct unless you were terribly and atrociously conservative with your TIAA investments. I have invested almost twice as much in TIAA-CREF as I have in combined Social Security payments. The dividend yield from my TIAA-CREF alone beats my Social Security payments, and the monthly benefit 5.23 times that of Social Security. The Wilshire 5000, which is a total market index, has a 40 year reinvested dividends real return rate of 7.74%, while Social Security is around 4%. Using the rule of 72 for a quick and dirty calculation. We find that every dollar you invested in 1977 is worth $19.6983 if invested in TIAA-CREF, but only $4.5948 if invested in Social Security. I am not a fan of privatizing Social Security but as a retired finance professor I have run this calculation a few hundred times. Thank you Bob for your comment. I don’t claim that for everyone the return on Social Security is greater than TIAA or other similary plans. It was just slightly greater for me when I compared the returns. One of the problems is that there are no studies of actual as opposed to hypothetical experiences comparing the two. My hypothesis is that those who are in TIAA-like plans for longer periods of time are more likely to have higher returns because of Social Security having a maximum benefit and the effects of compounding interest. Also very relevant, is that the Social Security contributions also cover disability and survivor insurance which TIAA-like plans don’t.